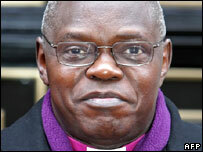 The Archbishop of York has called on Britain to make a formal apology for the slave trade. It comes as events round the world mark Sunday's 200th anniversary of laws abolishing the British slave trade. Earlier this month, Tony Blair expressed "deep sorrow" for the slave trade, saying: "We are sorry." But Dr John Sentamu told the BBC he should go further in expressing regret for the slave trade. Mr Blair is to address a ceremony in Ghana on Sunday. A video message from the prime minister will be played at the event at Elmina Castle slave fort, where slaves were held before being shipped to the Americas. House of Lords leader Baroness Amos is to tell the commemorative event in Ghana that the slave trade was one of the UK's most "shameful and uncomfortable chapters". Britain's first black female cabinet minister will also pay tribute to those who worked for the 1807 abolition laws. Baroness Amos, who is descended from slaves herself, is expected to tell the event: "Millions died, but they fought enslavement and rebelled at every stage." Dr Sentamu, the second most senior cleric in the Church of England, told BBC One's Sunday AM programme that Britain was a country which had once bought and sold slaves "as it did crops like onions or maize", and now had to make a formal apology. "A nation of this quality should have the sense of saying we are very sorry and we have to put the record straight," he said. Speaking in London earlier this month after a meeting with Ghana's president, Mr Blair said Britain was "sorry" for its role in the slave trade. Dr Sentamu, who helped lead the Church's own mark of repentance on a walk through London on Saturday, rejected the idea of paying reparations, but said a full apology would be an act of strength. Events are taking place around the former British Empire - which was the world leader in transporting Africans across the Atlantic to the New World. In the UK, an exhibition entitled Resistance and Remembrance Day - which includes a recorded video message from Nelson Mandela - is being held at London's British Museum. And on Sunday morning, Deputy Prime Minister John Prescott and the prime minister of Barbados, Owen Arthur, reopened the Wilberforce House museum in Hull. William Wilberforce was the parliamentary spokesman for the abolition movement. Deputy Prime Minister John Prescott told the BBC the emphasis should now be on helping African nations rather than formal apologies. "While I was in Ghana, at the Unesco conference on slavery, the minister for tourism said 'we don't have need for apologies, we need forgiveness from all, for all, for inhumanity'," Mr Prescott said. Charlotte Wilberforce - the great, great granddaughter of William - said the evils of the modern-day slave trade should feature more prominently in the school curriculum. "Unless people know what's happening nowadays they're not going to know what they can do to combat it," she said. Meanwhile, Save the Children UK has published a major report about modern day child slavery. It says that more than 218 million children aged between five and 17 are working as child labourers across the world. Spokeswoman Corinna Csaky told the BBC: "We've got children involved in prostitution and a range of different work that is harming them and in some cases killing them."